While organizations spend billions of dollars on technology solutions to automate their processes, the final step in those processes, the transaction, is surprisingly still stuck in the past. When documents need to be signed, inefficient processes like printing, faxing, scanning, overnighting, and data rekeying take over. But this is changing. Digital Transaction Management (DTM) has emerged as a new category of cloud services designed to digitally manage document-based transactions. DTM removes the friction inherent in transactions that involve people, documents, and data to create faster, easier, more convenient, and secure processes. Organizations that embrace the digital future can speed execution, lower operating costs, reduce errors, and provide superior customer experience. By staying digital these companies avoid the traditional pitfalls of lost or missing data and documents, breakages in processes, and lack of visibility into workflow. 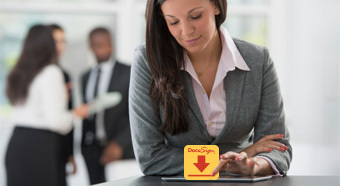 DocuSign is leading the way to help organizations deploy DTM. Some companies take a holistic approach to DTM and launch an enterprise-wide initiative in order to quickly gain value. Others start with a specific departmental need or use case and expand throughout their organization, building out their digital workflows and reaping enterprise-wide benefits over time. Users prepare for transactions by setting the order in which things are to be completed and the roles associated with each step. Transactions are executed with enterprise level security and advanced authentication methods to validate signer identity. The resulting eSignatures are considered more legally enforceable than pen and paper. 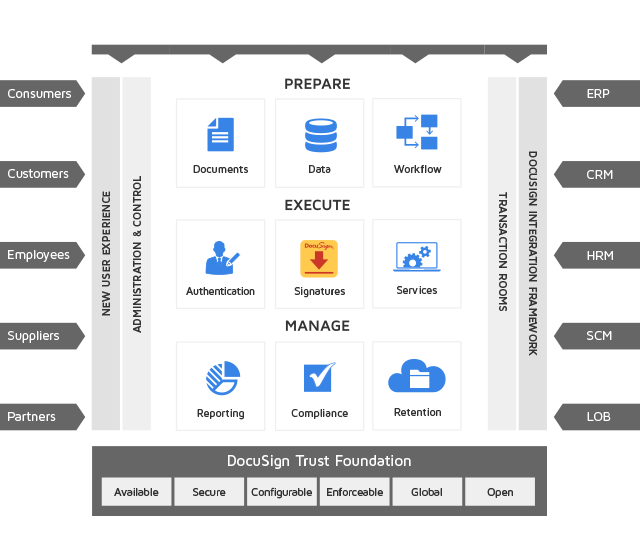 DocuSign is a complete end-to-end DTM solution that readily integrates with existing digital systems (including CRM, HRM, and ERP) and is easy enough for anyone to use. It’s also mobile-enabled, securely encrypted, and legally accepted around the world. Immediate financial gains – By reducing the transaction time, organizations see needle-moving financial benefits in weeks rather than months or years. Transforms the customer experience – Instead of waiting days, week, or even months for transactions to be completed, progress can be made near instantly. This velocity delights external and internal customers and elevates the organization that provides the superior service. Readily demonstrates compliance – Every document has a readily accessible digital audit trail to making documenting compliance for industry laws and regulations fast and easy. Falling under the purview of an independent governing board comprised of subject matter experts and leaders in their respective industries, DTM providers must adhere to a strict global standard for secure cloud-based Digital Transaction Management, xDTM. The xDTM standard protects and empowers organizations and consumers to securely conduct business online – with specific and measurable thresholds for availability, security, privacy and other critical elements. The goal of the xDTM standard is to ensure that everyone feels completely confident transacting in this new 100% digital era. Digital Transaction Management. It’s how business gets done in a digital world.